Haylie’s looking for some Asian inspiration! When her publicist books her to do Asian cooking demos for PopSugar, Haylie Duff turns to The Walking Dead’s Alanna Masterson for ideas. 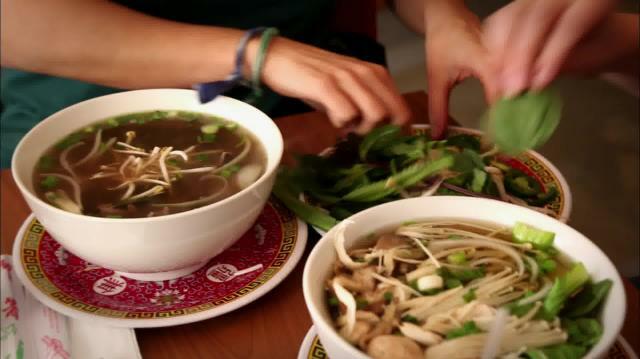 They check out Pho Cafe, make homemade soba noodles with Sonoko Sakai, and pick up ingredients from Bangkok Market. 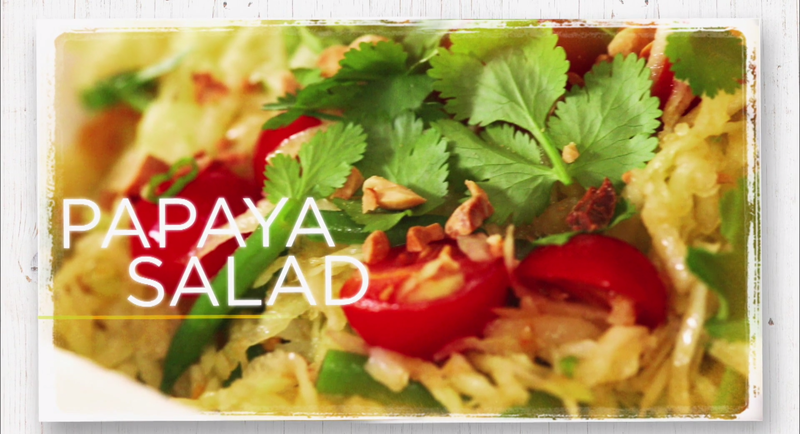 Will they be able to finish a Green Papaya Salad for PopSugar and make a soba noodle bowl for the demo in less than two minutes? Whisk first 5 ingredients in medium bowl. Slowly whisk in peanut oil and chili oil. Set dressing aside. Cook beans in medium saucepan of boiling salted water until crisp-tender, about 5 minutes. Rinse under cold water. Peel papaya, cut in half and discard the seeds and inner pulp. Shred with a box grater on the largest holes. Place in large bowl. In a blender, combine the first eight ingredients and ¼ cup hot water: puree until smooth and set aside. Heat a wok or large skillet on medium high. When it’s hot, add 1 tablespoon of oil and swirl to coat the pan. Then add the shrimp and cook until they just turn pink, about 2 minutes. Transfer them to a plate. Add another tablespoon of oil to the wok and swirl. Return the shrimp to the pan along with the peanut sauce, cooked soba. Stir-fry for 1 minute. Top with peanuts and cilantro. Serve with lime wedges on the side. Steep8 cups of hot water with 4 tea bags of black tea and 2 star anise podsfor 8 minutes. Take out the star anise pods and tea bags. When cool, add1 teaspoon vanilla and sweetened condensed milk. Serve over ice &enjoy!